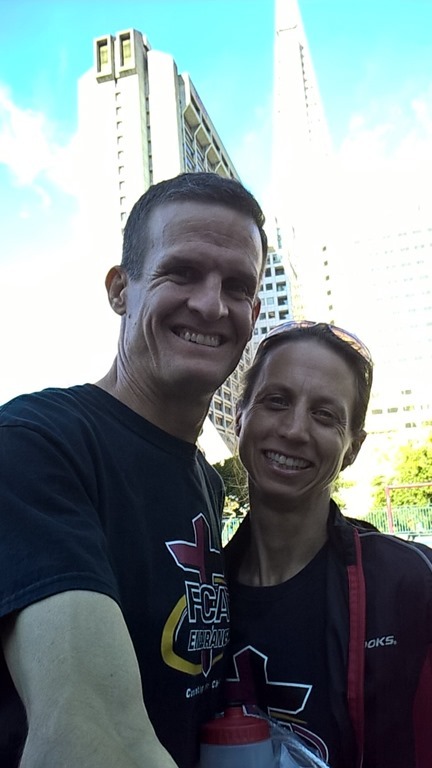 Troy and I celebrated our 10th Anniversary with the Boston Marathon. 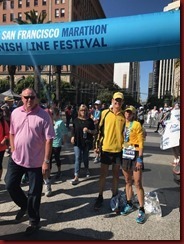 This year we are celebrating our 15th by running the 40th SF Marathon together. 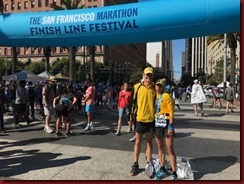 in 2003, our 2nd year of marriage, Troy ran the last 20 miles of the SF Marathon with me. 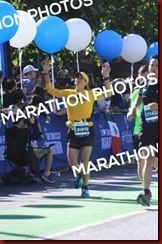 In 2013, Troy and the girls chased me as I did this marathon. A lot of great memories! We get up at 3:45, ouch! The main concern for Troy is getting through the first half marathon by my side. He’s had an Achilles injury since his Ironman and sitting at work has made it worse. For this reason, he’ll finish with the other 1st Half Marathoners. The concern for me is being able to get my bathroom use time in before the race starts. The other important thing I’m doing is practicing my race hydration for IM Coeur d’Alene at the end of August. 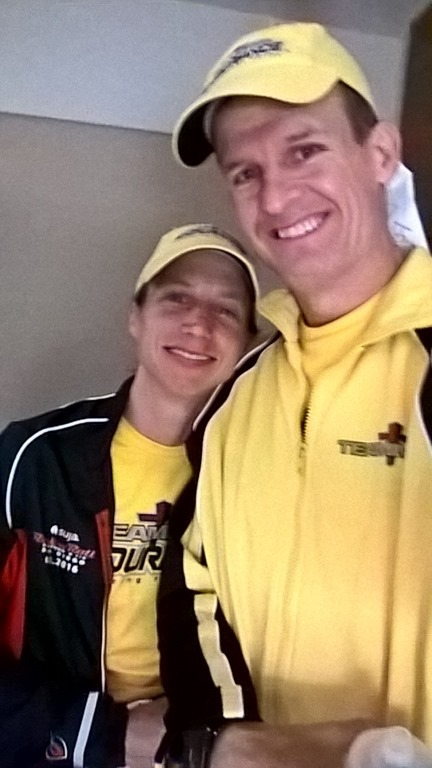 Troy had great success in IM Boulder drinking lots of water and sports drink on the course. I hope to be able to test it on myself. I’m wearing my Fuelbelt and carrying Vitargo. Never used it so it is a bit risky trying it on race day. I will make sure I drink a cup of water at EVERY aid station too! I will shoot for a sub 3:40. 3:35 (8:12 per mile) would be great but 3:38 (8:18 per mile) is much more realistic. The bathroom thing seems to go well. We go to drop off our gear bag and there are no trucks or volunteers. The race starts in like 25 minutes! Not good. The half marathoners and the 5Kers have their gear checks working great. We are not going to wait so Troy designates himself as the sherpa and ties our jackets around his waist. So glad we didn’t bring cell phones! Even though I feel warm with my long sleeve FCA shirt over my jersey, I decide to wear it anyway. We head to Corral 2. 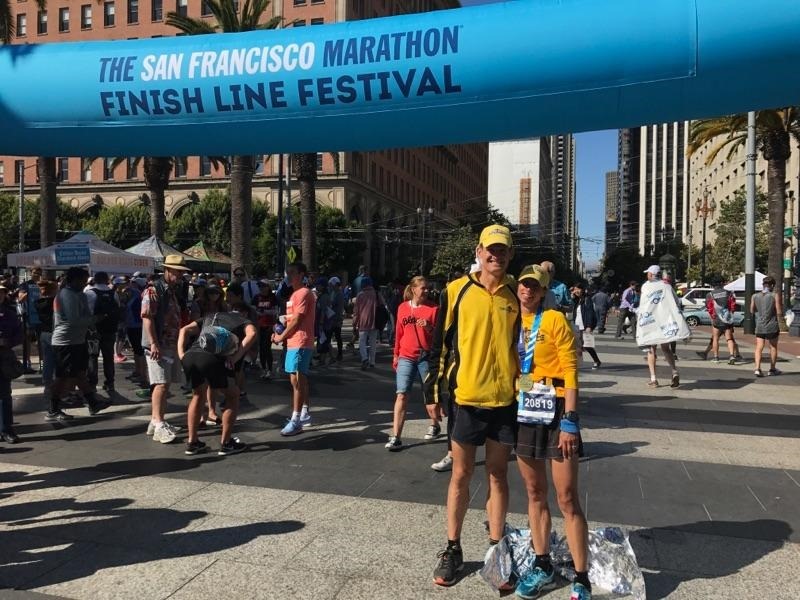 We meet a gal, Karen, who is racing her 249th Marathon! She’s a believer too so we all pray together. Very cool! The elite runners take off so we go in 2 minutes. I feel like I could use the porta potty one last time but it’s too late! Ready, set, go! Just as we are about to cross the start/finish line Troy sees our friend Jesse Ellis taking pictures. “Jesse!”, he shouts. Jesse smiles and snaps a quick picture. The chances of seeing him with all these people out here is crazy. That is a God moment for sure! I feel good the first few miles but I need to go to the bathroom. We are right by the 3:35 pacers. Around mile 3, Troy checks for an open porta potty but no go. Troy seems to be hanging in there. Thank you God! It really is a treat doing something hard with Troy. That’s how it’s been from the very beginning of our marriage and I hope we can keep it up! By mile 5, we are running through the Presidio. I’m averaging 8:05 pace according to my Garmin. I’m very happy with that! I find an open porta potty and get it done in less than a minute. The 3:35 pace guys are ahead now. Not worried. Up the first major hill, not bad! At mile 6 we hit the bridge! It’s foggy but we don’t care. It’s still beautiful. The ground is wet and they have workers next to areas they have placed mats over. Hope no one falls! This whole side of the bridge, northbound, is completely closed to us runners. Must be because of the 40th year and all the people (find out later it was because of threat of terriorism). We soon see the top runners coming back. We are totally shocked to see most of them wearing headphones. Thought those were banned, especially for elites! One guy has a huge set on his head. Interesting! Troy is doing great! He feels good! Yeah, thank you Lord! We really are having fun! At Mile 8, my Garmin says I’m averaging 8:05. We run around a viewing area/parking lot on the other side of the bridge. Troy tries to use the porta potty but it’s packed. He only needs to make it 5 more miles. Back over the bridge we go. Lots of people coming across! At MIle 12, my Garmin says 8:05. Nice and consistent! We are going to hit Golden Gate Park soon and that’s when I’m on my own! Troy and I are thanking God for being able to do the 1st Half together. He tells me to keep drinking and make it a goal to use the porta potty one more time to insure I’m practicing my hydration well for IM. He reminds me that those last miles I’m going to have to push just to hold the pace. We split off. 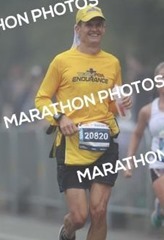 He’ll finish and then see me as I run nearby around mile 16. At Mile 13, I’m averaging 8:07. I don’t see the 3:35 pacers. Still not worried. The 2nd Half of the marathon starts soon. Those runners will become mixed in with all of us. Pretty soon, I see fast bunch go by ahead, 2nd halfers. I merge with them and it’s crazy how fast they are passing me. Then the 2nd halfers are off in another direction. This goes on and on the whole time I’m running in GG Park. So confusing! How they came up with these courses baffles me! My whole right leg just starts to hurt everywhere! Please, Lord, let me make it! I don’t see Troy at 16 but just after 17. He’s smiling and waving. Then he jumps in with me and says “smile”. Someone is taking our picture for him. I tell him that my leg is hurting bad and he prays for me. Just a little way down the road it feels better. Thank you Jesus! At Mile 19, The sun is out now and I’m averaging 8:05. Good, brought the pace back down. But now I’m looking at the miles, and my Garmin thinks I’m at mile 19.5. That means my pace is definitely slower than 8:05. Another reason not to slow down! The leg is better but I still feel unstable on the outside of my knee…I had the same thing at this time but worse in 2003! Even though SF is a hiller town than San Diego, this course is much more forgiving and hilly! Surprising! Back on the streets. We are meandering our way down to the bay where we’ll pass the Giants stadium and head back to the Bay Bridge area where we started. This means a lot of downhill running! 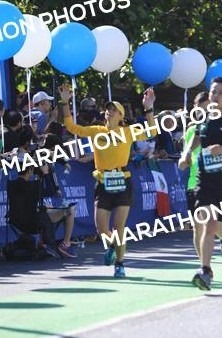 I hit “the wall” or mile 20 and I’m hanging in! 6.2 miles to go! 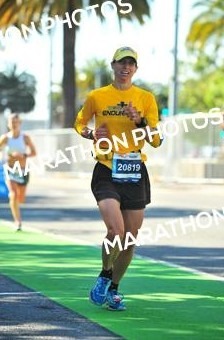 At Mile 23, my garmin says 8:06 and the distance is 23.6. Oh man! What a pain! Getting closer to the bay! Only 3 more miles! I still don’t need to use the bathroom. I’m glad because it’s a pain but I know I’m not hydrated. I keep drinking water at the aid stations and I’ve finally finished my 3 flasks…should have finished those miles ago! I’m feeling tired and it’s really hard to push. Please God, keep me focused. 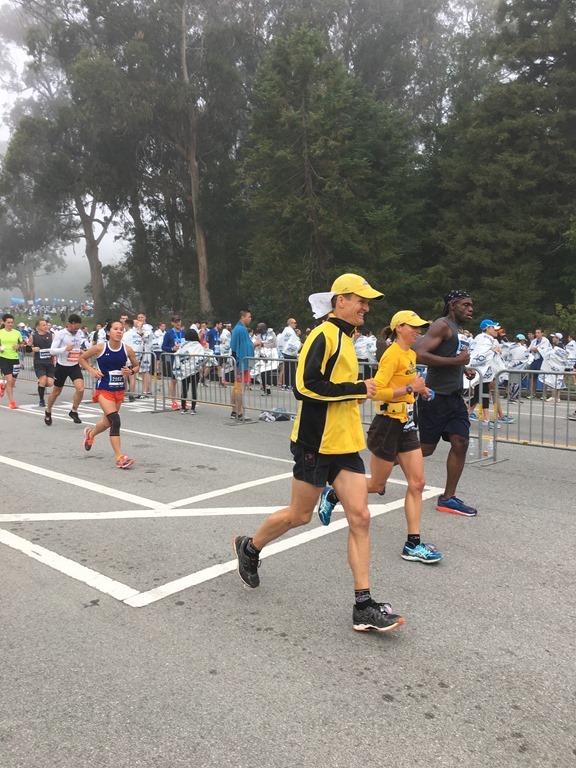 I’ve told myself that when the next pace group goes by for the 2nd half, I’m going to try to hang on. Soon they come by and I push hard. I’m not exactly staying with them, but they are close! Yeah! I can break 3:40!! 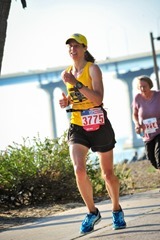 At mile 25, my garmin says 8:07 and 25.7. I see Troy. He is cheering and smiling. He says something about 3:40. Did he say the 3:40 pace group is catching me or that I can beat 3:40. Oh boy, better push to be safe! I see the finish chute soon. Yeah! Go, go, go! I dig deep and put in my fastest mile for these last 6. Yeah! I hear my name and it’s Jesse Ellis! I smile and he snaps my picture. Just a little more! 3:38! Thank you Lord! What a day! Now it’s time for some anniversary fun! 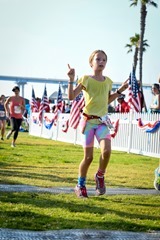 It’s been hot in Auburn so the cooler coast climate here in Coronado Island is great for running. My legs and achilles have been really stiff and I haven’t run much. This is a fast-pace race so I’m concerned but at least it’s only a 12k. I never know how things are going to go so I try to be optimistic. 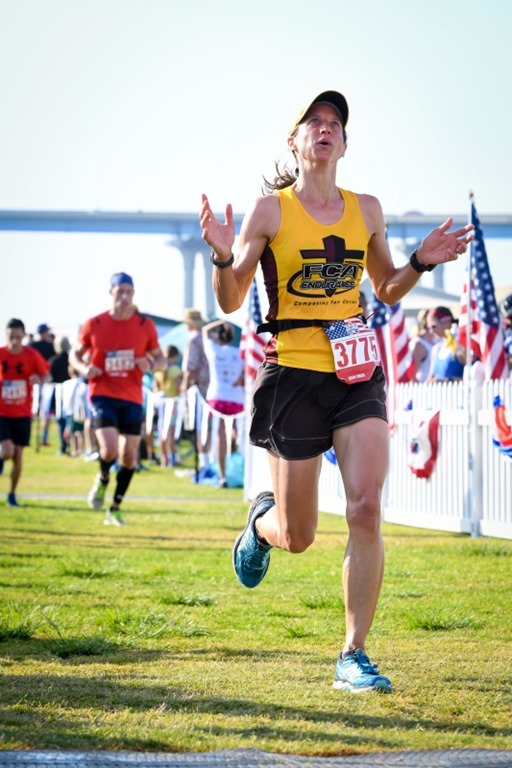 Have the fun of the racing is going through the motions of registering, warming up as a team, strategizing, and most importantly, praying and realizing the Lord is the only One who can calm any fears I have. The girls, cousins and Grammie are doing the 5k. Robin and I get to line up together for the 12k. Always a treat! A great speech, great starting line, a lot of stretching and preparing, and we’re off.. Under the flag, across the grass, my slow start leaves me a little behind everyone. I’m being really conscience of form: outside of the feet, relaxed lower legs, good hip and glute form. I start to warm up and catch up to Robin. Always love running next to Robin in a race. Robin is shooting for 7:15 and me, 7:00. So we part ways and I continue trying to run relaxed and smart. I really don’t know what to expect. I could get tired quickly or have a foot or calf seize up. But for now, things feel good. Mile 1. 6:56. That’s good. Along the golf course now. Gradual speed bumps in the road seem to sneak up on me. I remind myself each time to watch my step. It’s like I’m giving so much energy to running I hardly have any left to think about not falling. There’s a woman up ahead that I try to keep up with. The foot is holding up. Mile 2. 6:40. Wow. 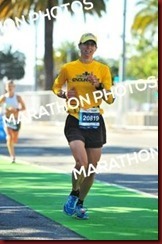 The woman is holding a good pace and I’m so appreciative to be able to match it. I’m already thanking the Lord! It’s been quite a while since I ran under 7 min pace. The long straight-away. Beforehand I told Robin “it’s just a 10k with a little extra at the end”. Reminding myself of that I keep expecting to be able to see the turn-around soon. We pass the Naval Base where we used to turn in. I think about all our brave service men and women. Mile 3. 6:45. Holding the pace. Eating a Cliff Block. Keeping good form. 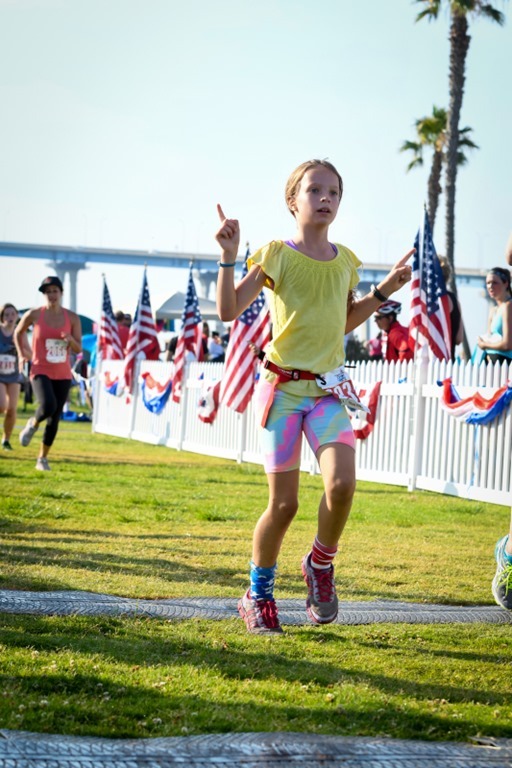 We go by the septic area – the stinky part, along otherwise beautiful, clean Coronado. I go by a man who looks 65 and running so well. I see the leaders coming back. The turn is farther than expected. Counting the women I see that the one I’m with is 5th. 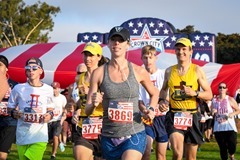 I make the turn and also pull slightly ahead of the woman, encouraging her. She’s helping me and I’ll help her, this way we’ll both get to the end faster. I can’t wait to see Robin up ahead soon..
Mile 4. 6:43. Going great! Thanks, Lord. And there’s Robin! We high-five. It’s so encouraging having so much support from each other and just wanting to do well for them. 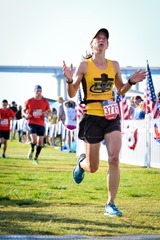 The woman I’m running with is surging and I’m having to talk myself into maintaining this tough pace. I want to slow down but maybe I’ll catch someone I know, maybe I’ll get a good place.. where is that next mile marker! Mile 6. 6:48. Good. Another woman is ahead and the one with me is making her move. Exciting to watch and definitely don’t want to get left behind now. Negotiating the speed bumps. Now she’s in 4th which means I’m in good position, too. Yes, the corner to the alley-section. Almost there. I take the corner well, out near the highway and back and now I’m ahead of the woman and running well! Mile 7. 6:33. Yes, catching 4th place woman got us both farther ahead. 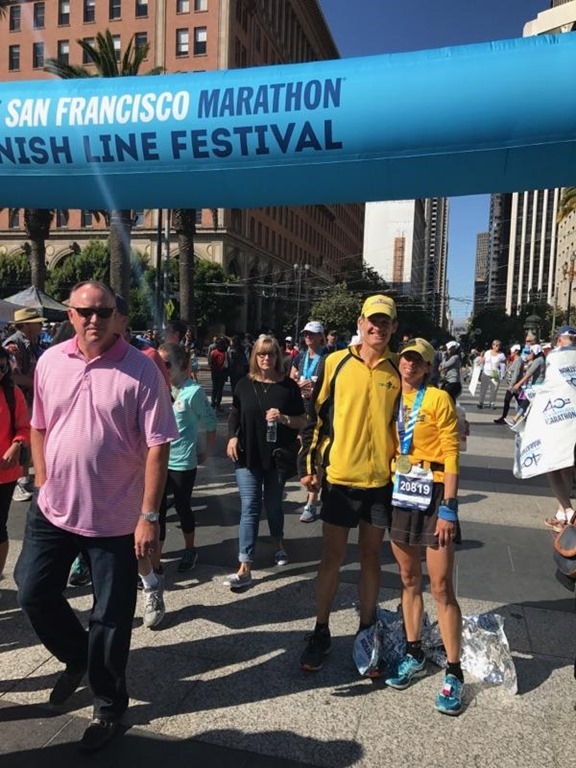 Now I see the 3rd place woman, and, sure enough, the woman I was running with comes from behind and passes me and her. Great job! Under the bridge and then I see our friend, Dan Cadriel. Although from Arizona, he’s always at this race and his choice to run shirt-less makes him easy to spot. He’s a good runner so it’s an honor to be able to pass him. But it’s also painful..
just a few more turns through the campgrounds.. my legs are yelling at me. The finish and I see the girls and Dad and Detrik. Thank you, Lord, for giving me more than I deserve and letting me have a fast, beneficial workout. It’s all for you! 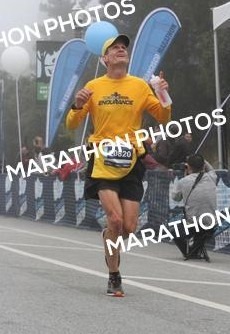 I finish in 50:33, 4th place, with a 6:18 pace for the last 1/2 mi. Very happy. 321 Go! Me and Detrick ran through the start line and ran under a big flag. I touch the flag all the way through. We ran together and Detrik ran ahead then I caught him then he did it again. After the first mile, he stopped doing it. We ran through an aid station and got water. Detrik got Gatorade as well. We kept running and we started to see runners running back. We turned around and started running back. I started to say good job to everyone we went by. Detrik says I’ll lose my breath if I keep doing that, but I continue anyways. Detrik sees Anika and Ariel up ahead running together on the other side. I see my Grammie also a little bit behind them. There is a little girl running next to me. She is running fast so I pick it up and run with her. But then I slow down so I can run with Detrik. We run and I keep telling him that we are almost there. We run through the finish line together. It was fun! 10, 9, 8,…,3, 2, 1, go! 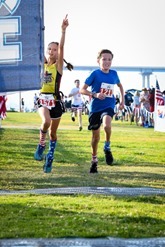 Anika and I run across the starting and under a huge American flag. We get on the path. I tell Anika we are in front of the 30 min pacer guy. It's not long until we get to the first mile marker. There is an aid station. We keep running and looking for the turn around. We see Detrik and Anna. We say good and job. I tell Anika we must be close to the turn around. We turn a corner and it's not there! We go around another corner and Anika says ”there it is!”. We turn around and the 30 minute pacer passes us. As we get back to the path, I can hardly see him. Anika says she's not feeling well and that I should go ahead. I start trying to pick it up to catch him. I am getting closer to the finish. I see the pacer finish but I'm close. I finish 15 sec back. This is a new record for me. Thanking God!